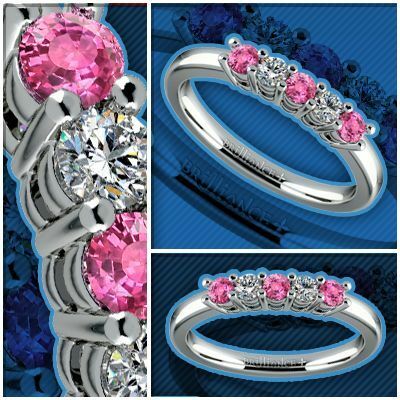 Brilliance proudly shines the spotlight on this beautiful and classic diamond Five Diamond Wedding Band with Pink Sapphire with a delicate-colored twist. It features an open gallery setting of two round-cut diamonds with a total weight of 1/3 carat, and three pink sapphires in a shared prong. Set in a choice of 14K or 18K white gold, this ring is sure to add a romantic touch to any nuptial ceremony.